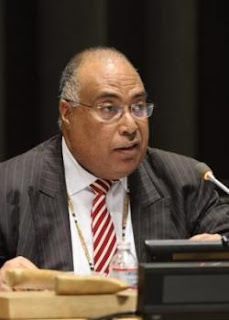 Frustrated Melanesian nations are concerned their voices are going unheard and blame global politics for intensifying disasters, conflict and food insecurity in the region. At the conference “Security3: Food Security, Biosecurity and National Security in the Melanesian Arc” held in Canberra last month representatives from the governments of Fiji and the Solomon Islands urged donor countries, including Australia, to take stronger action against climate change, warning that the writing's on the wall. The countries have long been among the most outspoken on the dangers of climate change. The global responsibility to fight climate change, they said, needs to be taken seriously — and for the governments of many developed nations — it is not. War, famine, natural disasters and food security are among the global issues that were directly linked to climate, the speakers said. Addressing climate is in the global interest. “It is the heart of our problems,” Yogesh Punja, Fijian high commissioner to Australia, explained to the audience. For Australia, a fundamental role of the aid program is in creating a secure Indo-Pacific region. But there is an increased risk of conflict caused by the relocation of climate refugees that threatens government stability and regional economics. As politics sees the U.S. move from focusing on global issues to national ones, many wonder what the knock-on effect will be. Australia, too, is causing concern for Melanesia. Despite signing the Paris agreement and investing new funds into the Green Climate Fund, as well as co-chairing the fund in 2017, Australia is sending conflicting messages on the value of renewable energy. The federal government is now pushing for “clean coal” to be considered as part of solutions to meet renewable energy targets. “Everybody is confused,” Punja said. “As a region, I don’t think we have grasped the true position Australia has.” Australia’s talk and actions were conflicting, Punja said. He pointed to a programme to develop Northern Australia's coal export industry and controversial approvals for badly polluting, heritage-wrecking coal mines, as key concerns. Financially, he noted, there is little barrier to countries such as Australia and the U.S. from doing their part. Aid programmes were a key area that could address the needs of Melanesian countries in becoming more resilient to the effects of climate, but Punja and Beck both said current programs needed to include greater involvement of recipient countries to ensure funds are better directed to areas of critical need. Investing in large-scale renewable energy and focusing on improving capability and services for rural areas, is a particular focus for the Solomon Islands in building a climate resilient and sustainable nation. The Paris agreement, Beck said, was the “first and last line of defense” in the global response to addressing climate change. He warned there were probably only four years left for nations to take action in order to to avoid a regional disaster. The ticking clock is not something the 9.7 million strong region is taking lightly. Representing 98 percent of the Pacific region, Melanesia is addressing the issue at every forum and taking global leadership roles to ensure positive action is being taken, including pushing for their issues to be addressed in the Sustainable Development Goals.